MouseSavers.com Readers always get best available member rates PLUS 2,000 extra rewards points per night at Courtyard by Marriott Anaheim Theme Park Entrance! These points are in addition to the points you’ll already receive for your nightly rate as a Marriott Bonvoy (formerly Marriott Rewards) Member. And, these rates are fully changeable and refundable up to 48 hours prior to arrival. See below for more details. The Courtyard Anaheim Theme Park Entrance is a welcome addition to the off-property hotels near Disneyland. Located on South Harbor Boulevard, next to the Howard Johnson hotel in Anaheim, the Courtyard is just a ten-minute walk from the entrance to Disneyland and Disney’s California Adventure. 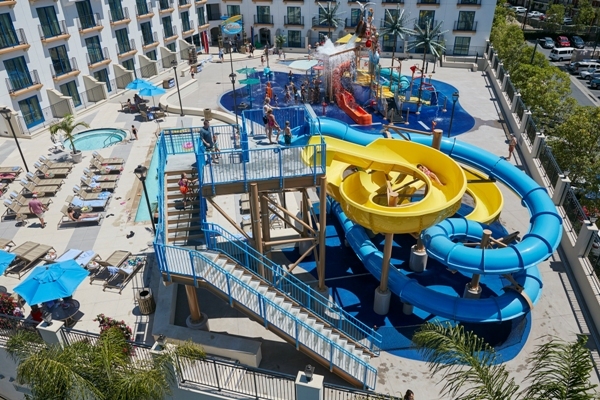 This Courtyard by Marriott offers larger-than-average rooms that easily sleep up to 6 and a waterpark with 30-foot waterslides, a 400-gallon drench bucket, and separate kiddie and lap pools. A terrific location and family-friendly culture have made it an immediate hit since opening in the summer of 2015. The Courtyard has already established a reputation for exceptional service and cleanliness, and is actually owned by the same family that owns the Howard Johnsons across the street, a perennial favorite of MouseSavers readers. In fact, the hotel is so popular that special deals and discounts are seldom available. While rates are somewhat higher than you might find at similar branded hotels, rates are lower than you’ll find at the comparable Disneyland Paradise Pier Hotel, and the value is excellent. The Courtyard is a 100% non-smoking hotel. Built to be family-friendly, the Courtyard offers extra large rooms that accommodate up to six people. Each room has over 530 square feet of space and features either one king size bed or two queen size beds and all rooms feature twin bunk beds. There are a few 1-bedroom suites with twin bunk beds included in a separate living area. Rooms are stylishly decorated in hues of rusty orange, brown and blue, and include a banquet or diner-style table with corner booth style seating and an overhead lamp – a great gathering spot for a snack or game. A fanciful seascape mural adorns one entire wall, reminding you that you are on vacation. 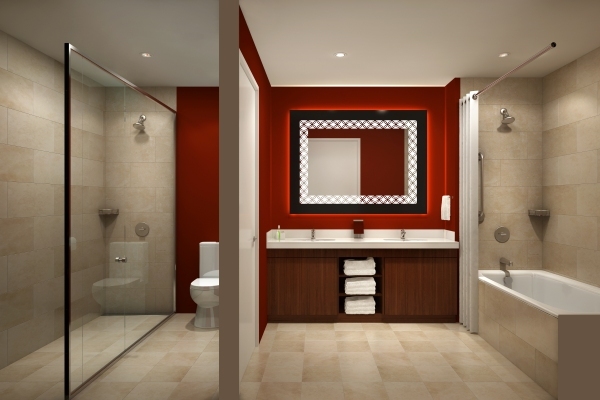 Every guest room includes two showers: one shower/tub in the vanity area and an additional glass walled shower in a separate toilet area. Having access to two separate showers offers a huge time saving value for families! Standard room amenities include free high-speed Wi-Fi, flat-screen LCD televisions, and Netflix streaming capability. Every room also has a small refrigerator, Keurig coffee maker and microwave. All rooms are air-conditioned, non-smoking, and have been constructed with double pane windows, which means you won’t hear street noise or the kids playing at the waterpark. Some rooms have views of Disneyland Park. All of the water features are heated to 82 degrees all year (the whirlpool spa is heated to 104 degrees). 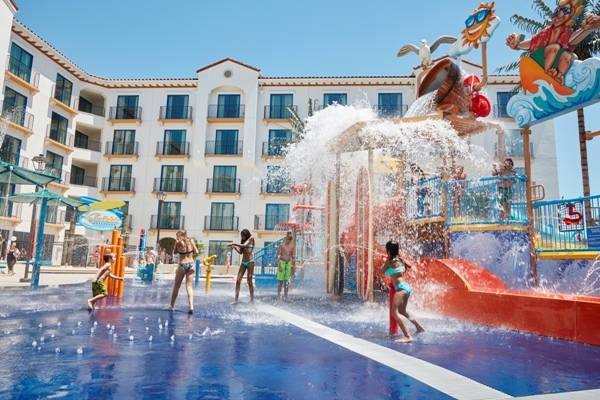 Surfside Waterpark has something for adults, kids and toddlers so the entire family can play together. If you want a workout, there is an 1,100 square foot state-of-the-art fitness facility with cardiovascular equipment, and Web console flexstrider/treadmill/elliptical/bikes & weights. Guests must be 16 years of age or older to use the fitness facility unless accompanied by an adult. There are several good dining options both in and just outside of the Courtyard Marriott. The Bistro, just off the main lobby, is the hotel’s main restaurant and is open for breakfast and dinner. Breakfast includes hot and cold breakfast dishes such as oatmeal, fresh fruit, as well as eggs with bacon and breakfast sandwiches. Starbucks coffee and beverages are available throughout the day at The Bistro. The dinner menu consists of heavy appetizers like BBQ chicken flatbread or buffalo wings, several salad entrees and hot sandwiches or simply 1/2 roasted chicken or BBQ Ribs. 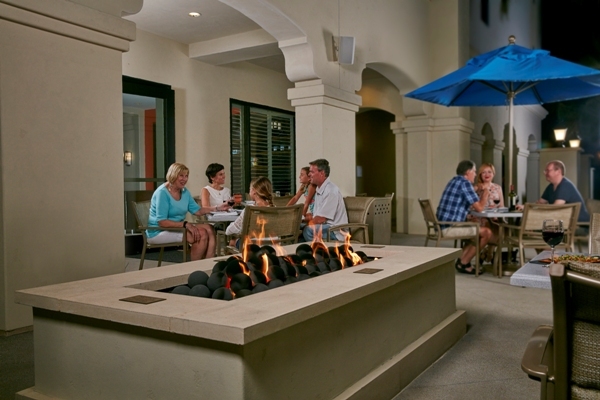 The outdoor Terrace seating area is adjacent to the Bistro and features a cozy fire pit. Guests can order food and drinks from the Bistro menu to enjoy outdoors, and even watch the fireworks! There’s a large gift shop and an on-site Market open 24/7 for grab-and-go snacks, beverages, and sundries. The Market is fairly limited in what’s available, and is pricey. If you want to stock up your mini-fridge with snacks, or milk, water and sodas you would do better to walk or drive to one of the various small markets or drugstores on South Harbor Boulevard or a nearby grocery store. There are Safeway grocery stores located north of the Disneyland parks at 130 W. Lincoln, or just south of the parks at 12961 W. Chapman, in Garden Grove. If none of those options meet your needs, you can stroll about 100 feet from the Courtyard lobby to Mimi’s Cafe, a terrific, value-priced restaurant that serves breakfast, lunch and dinner. Mimi’s is a regional chain and we’ve eaten there many times. It has attractive theming (each room of the restaurant is slightly different) and excellent food. If you get tired of Mimi’s — which will be difficult, because it has a huge menu — you’re only about a 3- to 5-minute walk from other dining options, including Panera Bread, McDonalds, La Brea Bakery, Denny’s and IHOP. On-site valet parking is required at the Courtyard by Marriott Anaheim Theme Park Entrance property and is $20/day. Self-parking is not available. There is no airport shuttle service to this hotel, however you can take a cab or Lyft from John Wayne Airport (Orange County) for about $47 one way, or alternately use a private shuttle service such as Karmel Shuttle for $16/person one way. Cab fare from LAX runs about $125 one way, or alternately use a private shuttle service such as Karmel Shuttle for $22/person one way. The Disneyland Resort Express airport motor coach is also available for pick up and drop off at the neighboring Howard Johnson. If you are touring the area and need a car, there is a Hertz Rental Car location nearby at 221 West Katella Avenue. It is an easy walk from the Courtyard by Marriott to the main gate into the theme parks. It should take you about 10 minutes. (Believe it or not, this hotel is almost exactly the same distance from the Disneyland entrance plaza as the furthest tower of the Disneyland Hotel!) If you prefer not to walk, the hotel participates in the Anaheim Resort Transportation system (known as ART), which will take you to and from the Disney parks all day for a small fee. We had an exceptionally pleasant stay at the Courtyard while visiting Disneyland recently. 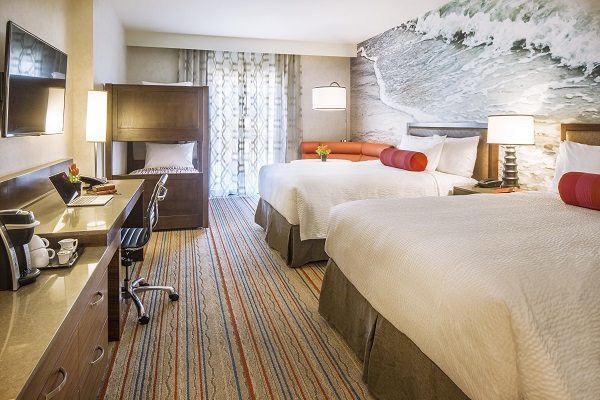 MouseSavers guests get the best available flexible Member rates PLUS 2,000 points/night at the Courtyard by Marriott Anaheim Theme Park Entrance! Book your stay at the Courtyard Anaheim Theme Park Entrance and earn an extra 2,000 rewards points per night! MouseSavers guests will receive best available flexible (refundable and changeable) member rates when using the link above. Reservations are fully changeable and refundable up to 48 hours prior to arrival. MouseSavers guests will receive an extra 2,000 Marriott Bonvoy (formerly Marriott Rewards) Points per night from their room rate. These points are in addition to the points you’ll receive for your room rate as a Marriott Bonvoy member. If you are not already a member, not a problem, go ahead and book this offer and you will automatically be enrolled in the Marriott Bonvoy program. It’s free to join! 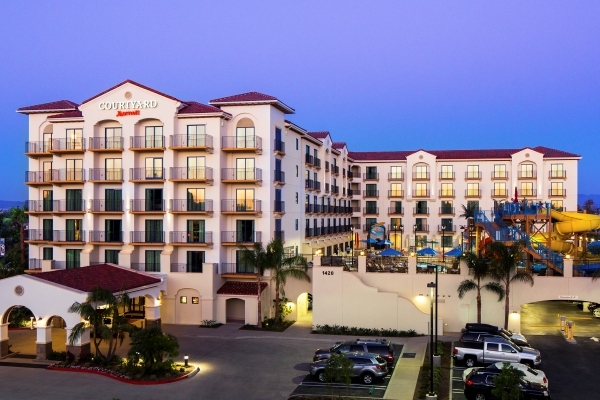 On-site valet parking is required at the Courtyard by Marriott Anaheim Theme Park Entrance property and is $20/day. Self-parking is not available.